I have sensed the anticipation and excitement building for a few weeks now. Everyone is talking about it and so I can deny you no longer. Here, after two weeks of tangible yearning, is the photo of our new fireplace that I promised you. I was inundated with a request to share this so here you go…. Exciting stuff for sure. Last week the decorator came and re-decorated the front room. It was a true dilemma, as my natural tightness was fighting with my absolute hatred of wall papering, but sense prevailed and every penny spent on my not having to do it was worthwhile. In under two days he had stripped all the old paper off, glossed everything that should be glossed and re-papered. For me that would have been a two to three weekend job and a real threat to my will to live. It helps when you have the right tools of course. He had some instrument of medieval torture to strip the walls with which had a blade so sharp he needed no steamer or much elbow grease. He just applied a little water, wielded his diamond edged blade of death and not only did the wallpaper surrender itself with ease, it had the good grace to leave the old lining paper on the walls too. The pathetic stripping tool we own is pitiful in comparison and it takes several days in steam room like conditions to get a few strips off the wall. When it came to the actual papering he had a pasting machine. Who knew these things existed? He just passed the paper through it on some roller thing and it applied a perfect layer of paste in about three seconds. No wonder I’ve been crap at decorating. I just don’t have the right equipment! He’s done a great job, better than I could ever have of course, so it is money well spent. Having just spent a couple of hours at a garden centre, crammed full of Christmas shoppers decorations, I would struggle to put most of the latter into that same category. We bought a few things, mainly some new lights for our tree as last year’s new lights will be in a ball somewhere in the cellar. With a few extra bits for Louise’s colour scheme this year we left with our financial health relatively unscathed. Having looked at a few items which we thought were nice only to find we’d need to sell the house or a kidney to have them, we decided to try elsewhere. Being a Grandad has clearly changed my life immediately, as spending Sundays in garden centres is my destiny and I embrace it. I have ordered my cardigan and slacks and my Honda Civic is due to arrive any day now. I had a night off from gigging last night, and it was nice not to have to load all the gear into the car in the rain (it always rains when I do that) for a change, so we had a look for a decent film to watch. Now, we have several streaming services at our disposal, with literally thousands of films to choose from. Nothing jumped out that we haven’t already seen, so we (well, it was Louise’s choice) decided to invest a fiver to buy a film from the Virgin Movies thingy. That film was a Tom Cruise film, which usually promises an hour and a half of turn your brain off entertainment and action. In this case….not so much. We watched The Mummy. It was incredibly poor. Before I get to the “plot” it was most confusing that the woman out of Peaky Blinders used more accents than a french person spelling lots of words with Es in them. British, a bit of American, a touch of Irish and many more. Perhaps she was demonstrating her vast range of dialects for future projects. The plot was wafer thing, been done to death, not least by all the previous Mummy films and I fell asleep for about half an hour which did not prevent me from understanding what happened. 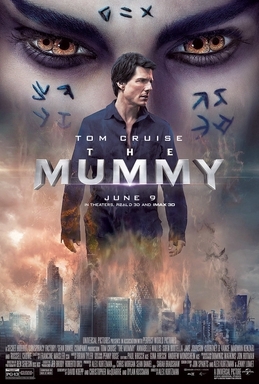 Spoiler alert, The Mummy is defeated, Tom gets the girl and the comedic sidekick makes some very poor jokes just before the titles roll. Poor Tom, very poor. Must do better. By the way, you owe me a fiver and about ninety minutes of my life back. The most worrying thing about it was that the ending pretty much guaranteed their plans to make this into one of those franchise things, with multiple sequels being a distinct possibility. Having done so earlier this week, I can assure you that I really would prefer to watch paint dry. Right, I have stuff to do, Emily is sat watching Hercules for the gabillionth time and at some point the dogs need walking.